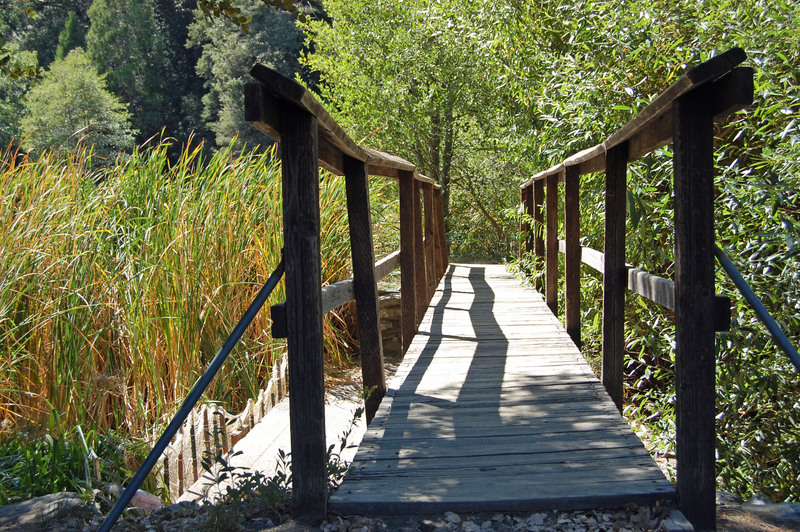 This kid friendly hike near a campground features a bridge on the way to a fishing pond! I’m of the opinion that all families should spend more time outdoors together. While this trend of constant digital connectivity is great and all, one of my biggest fears is that people will eventually cease to appreciate the unplugged solitude of nature. Camping is an easy way to experience the great outdoors as a family. But before you get too excited, know that family camping doesn’t come without its minor challenges (I said minor!). I’ve heard from numerous parents who are scared to death their kids will get bored (and subsequently really annoying, I would imagine) if they don’t have access to their quiver of digital toys. Have no fear! It’s been my experience that kids freaking love the woods. Let ’em loose all day, and by the time you’re done roasting marshmallows around the campfire, they’ll want to climb into their comfy sleeping bags and sleep through the night. You hope. Now we don’t have kids, so all of that is probably easy for me to say. I’d like to hear from the moms and dads out there who have actual camping experience with kids, as opposed to someone who is currently in a Rent-A-Nephew arrangement. Without further delay, the following suggestions are just a few tips to get you and your family out there. How rugged do you want to go? There are so many great campsites available, both primitive and developed. Each has its advantages. Primitive sites are great if you’re looking for true solitude. It will be just you and your family enjoying all that nature has to offer. On the other hand, especially primitive sites generally lack toilets (if you’re lucky, there might be a vault toilet nearby). This could be a problem for some people. Chances are you’ll be more comfortable in a developed site, where you almost always have access to toilets and (sometimes hot!) running water. The trade off, though, is that you’ll be surrounded by a hundred other people. Some of you campers out there don’t find this annoying. I get a little irritated with the noise—generators, loud people, lots of cars coming and going. But again, I don’t have kids. Something to think about. If you search hard enough, you might find a small, primitive feeling developed site with toilets. This would be camping nirvana for a family with kids. Everyone has different comfort levels. I could throw a sleeping pad and sleeping bag on the ground by the fire and snooze just fine. That’s probably not going to fly with mom, dad, and the kids. So plan ahead. If you’re sleeping in tents, buy sturdy air mattresses. If you’re a RV type of camper, you already know the drill. The challenge is to not get too out of hand while maximizing your comfort. I’m always baffled when I see families huddled around a television at a campsite. To me, you have officially defeated the purpose of a quality camping trip. Plan something, whether it’s hiking, biking, kayaking—anything! The point is to get away from the campsite long enough to see the area. The beauty of camping is how amazingly cheap entertainment will cost. Last I checked, it was something like $2,000 per head, plus your second born child to enter Disney Land for the day. Not so in the great outdoors. Not even close. Ideally, you’ll spend most of your time at your campsite early in the morning making breakfast and gearing up for the day ahead, and later on at night around the campfire making dinner and getting ready for bed. If you’re crafty (and I’m not), you could find plenty of fun stuff to do while in camp. I’ll leave that to all you Pinterest types out there. OK, now you can officially get excited. Start planning! If you’re a tree hugging, outdoorsy mom or dad, what else do you think we should add to this list of tips?